In my previous post I introduced you to what Moodle is and why it was chosen as the Learning Management System at St Andrew’s College. There was also a link to our Moodle Site so you could see the home page and other publicly available content on it. The reality is that the majority of the teaching and learning on Moodle happens behind a username/password protected area that is available only to students and their teachers. Teachers can have complete confidence all students have access to all resources, therefore creating a “no excuses” environment. If a student has misplaced a resource, they can simply download it again anytime they choose. Typing errors are eliminated – once logged in a student can easily click to whatever link they need within their class Moodle site – they would never need to directly type a URL or link into their browser to access a site or content their teacher directs them to. A centralised platform for students to “start” from is provided. Many teachers will branch out from there with links to other content and resources and this is actively encouraged. However, Moodle means teachers do not have to maintain their own blog or wiki sites to make content available for their students – StAC’s Moodle site takes care of that. Students can co-create content alongside their teacher and help create new directions and learning pathways online. Reduced dependency on paper based resources – with electronic resources online, and full submission of various forms of assessment a move towards a “paperless environment” is achievable, making marking faster whilst being kinder on the environment. These are just some of the benefits of Moodle – I will touch on others in future posts, but will now demonstrate some of the ways it is currently being used. Building on an established tradition at St Andrew’s of celebrating student success, the fantastic Communications Team within the College regularly posts on the front page of Moodle. Examples include Natasha Lloyd’s Gold Medal swimming efforts, the StAC Boys Golf Team winning the Canterbury Championship, to cultural events like the Prep School Kapa Haka performance and student reflections on a trip to Vietnam. Additionally, internal events are promoted to students as well, such as upcoming Productions. Various files uploaded to Moodle for students to access. 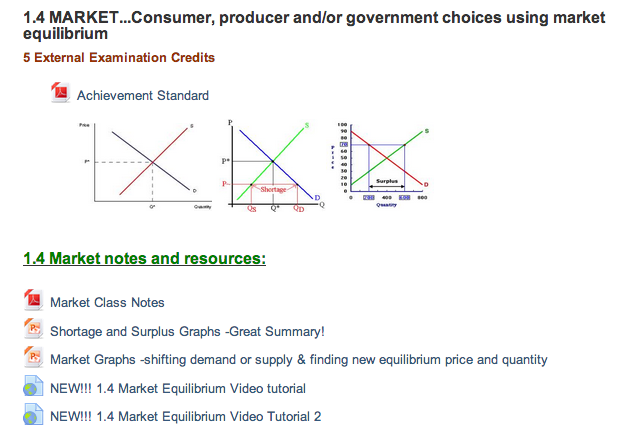 At the most simplistic level, Moodle can be used as a place to “put stuff” for students to access – here is an example from a Level 1 Economics course that includes PDF’s, Powerpoint Presentations, links to Video Tutorials and a copy of the Achievement Standard that the students are working towards. An embedded copy of “Heavenly Creatures” from ETV into Moodle – all students can access this. Whilst there is a huge range of activities and resources included as “native” in Moodle, one of the strongest features is the ease of adding in third party content, allowing the teacher to maximise the benefits of other resources on the Internet. 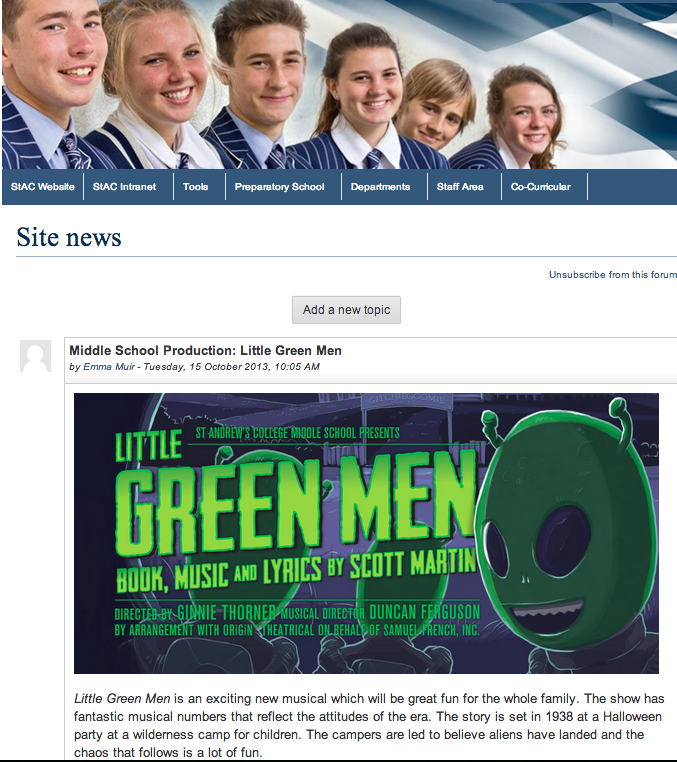 One example that some staff use is embedding multimedia content from either http://www.youtube.com or http://www.etv.org.nz. ETV is a resource that all staff and students have access to and provides real time and pre-recorded access to a wide range of TV channels (both free to air and SkyTV). 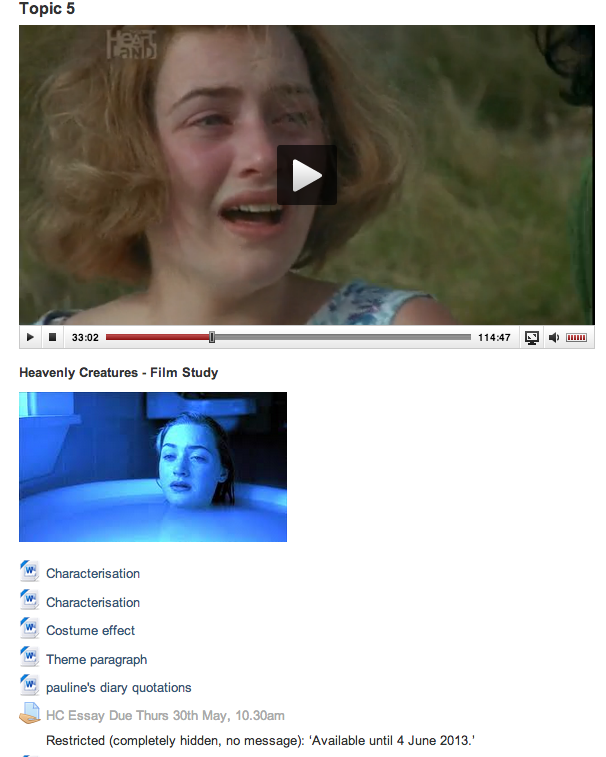 In the example on the right, a Yr13 English class has the entire film of Heavenly Creatures embedded into the class Moodle site. This way the students can view the movie, or specific scenes, at their own pace and from anywhere – both in the classroom and at home – without requiring access to the physical DVD of the movie. This allows for a massive shift in teaching focus, since now students are not dependent on the teacher choosing 2-3 scenes for them to examine, and then showing it on the classroom projector. Instead, students can choose their own scenes, pause and rewind as necessary, freeing the teacher to provide support in the learning, rather than concentrating on the management of the DVD player and projector. This is one of the most popular functions within Moodle for both Teachers and Students as it allows for the online submission of marking meaning no “lost” homework by the students and no need for the teacher to take home lots of paperwork for marking. On the right is an activity prepared for a Yr9 Science class – there is an image from the classroom whiteboard taken by camera during the lesson when the teaching took place. When a student submits their homework assignment, the teacher is automatically notified via email that there is work to mark. 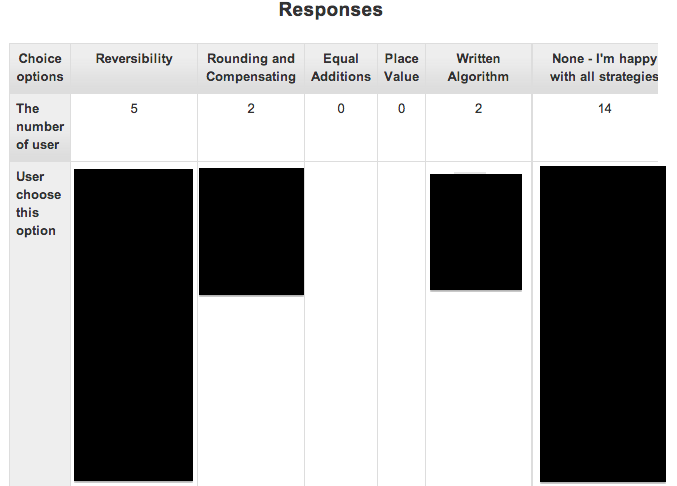 In the screenshot to the right you can see a student’s work that has been submitted and date/time it was “handed in” (including how early / late based off the due date). In this example the student was given a “Relational” grade which is then emailed back to them, and recorded in the teacher’s markbook for that course. Optionally, the teacher can write a comment and/or attach a file such as an exemplar to the marked work, before clicking on the “next submitted assignment” to be automatically taken to the next piece of homework available for marking. This is just one example of the many different ways that homework or assignments can be easily submitted and marked within Moodle (another common one is for students to be required to attach a file of their work e.g. a Word document or a Video clip). 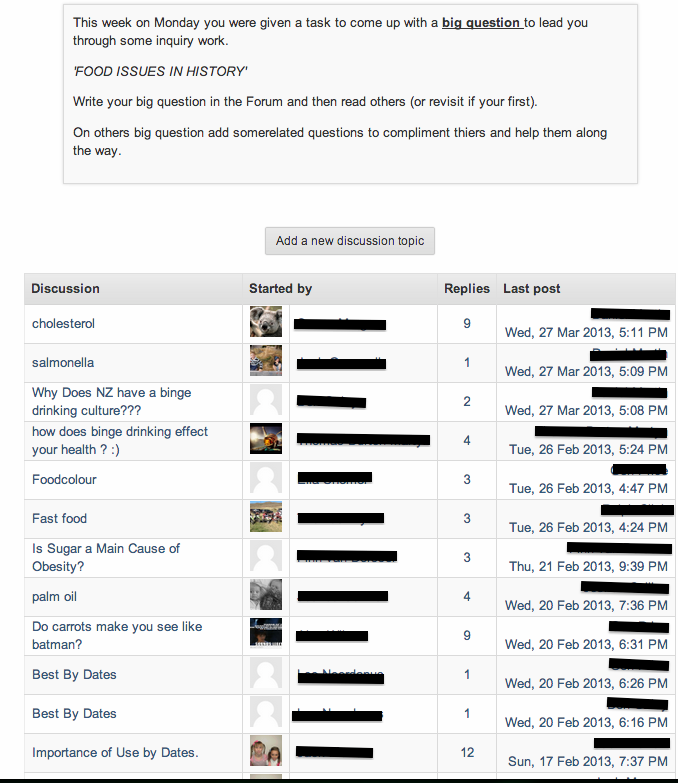 Yr8 Students using a Forum and creating their own questions for each other to comment on. 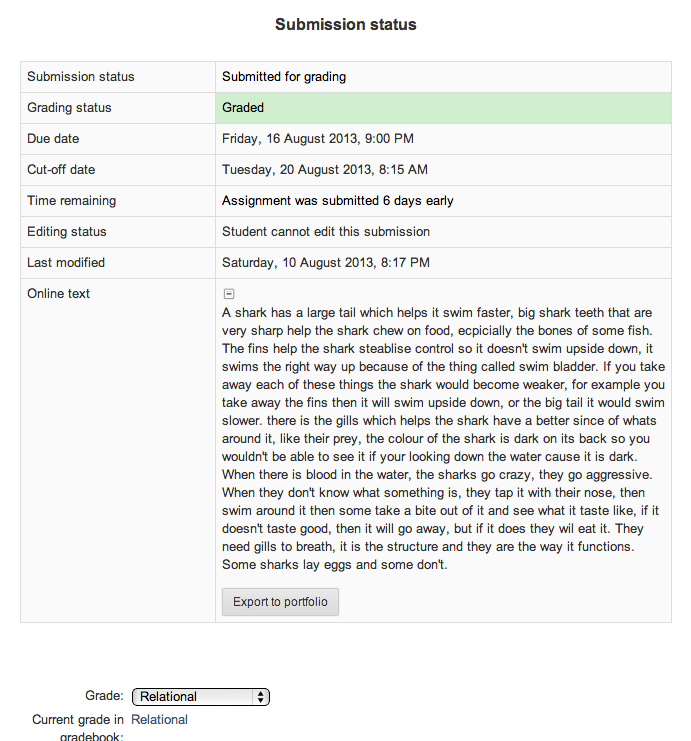 One of the more powerful features of Moodle is the wide range of assessment activities, ranging from the basic “type your answer into the browser” like the homework submission example above, to very complex, self-marking quizzes. 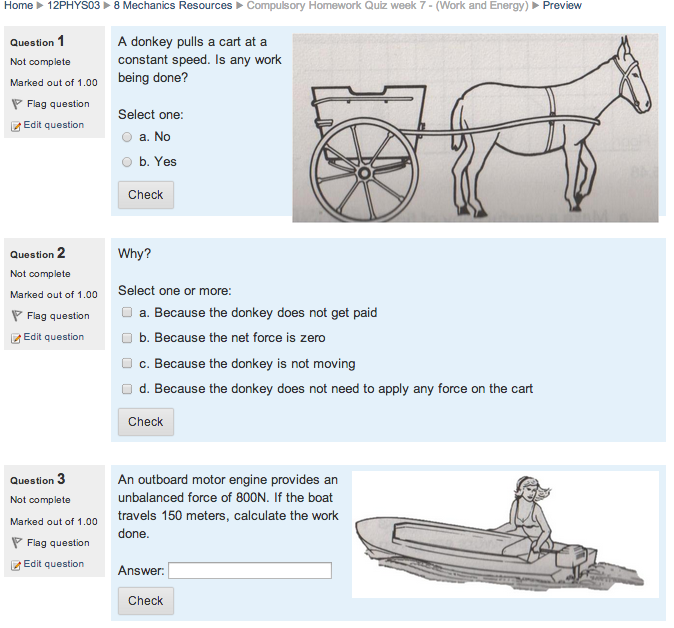 The example on the right (click to view full size) shows different question types in a Physics Quiz. Depending on what score the student makes in the quiz, individual learning pathways can be implemented e.g. a low score may have to complete additional revision activities before re-sitting the test, whereas a high score may allow a student to progress to new activities and resources that are not visible to other students. This allows for learning at the pace of the student, rather than a one size fits all approach. Another way quizzes have been used at St Andrew’s College is in conjunction with “conditional access” – until a student has passed NCEA “Achieved” level questions, they can not progress to Merit level questions e.g. 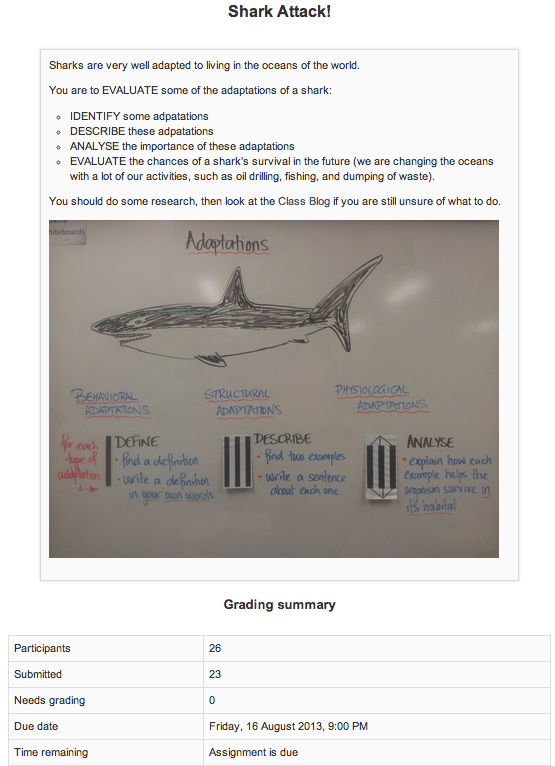 The last feature of Moodle that I will highlight today is Choice Activities – these are basically a simple poll of the students in the class that allows the teacher to gain quick feedback e.g. To solicit feedback from the students in terms of how comfortable they are with the content or strategies they’ve just learnt. 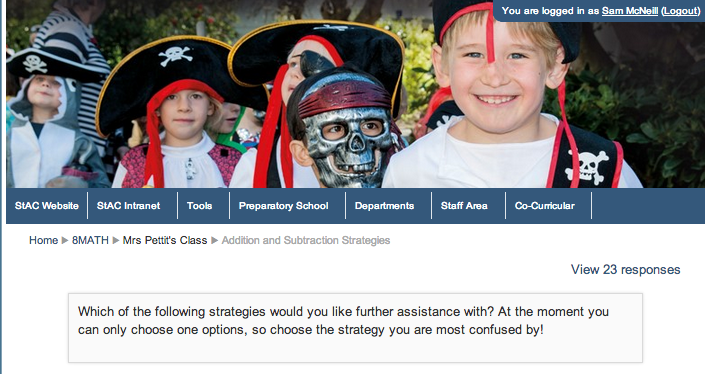 An example of this is from a Yr8 Math class where the teacher wanted to know which strategies relating to Addition and Subtraction they required further assistance with. 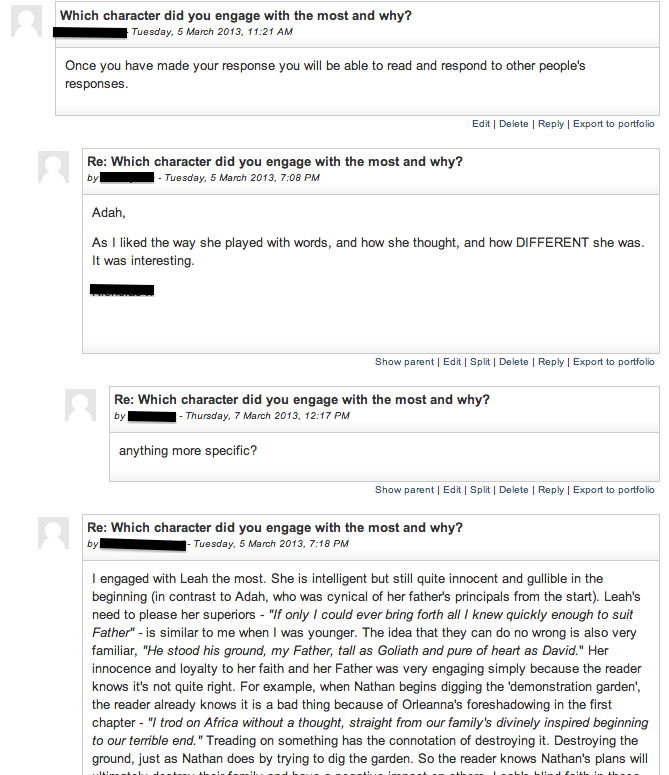 Although blanked out in this screenshot, each student’s name was visible in the column and the teacher needs only to select the student(s) to email them and arrange additional help or provide links to further resources on Moodle or elsewhere. Alternatively, the teacher can allow students to see the results of the Choice Activity, either after a specified deadline (to avoid students being influenced by other choices), or immediately upon voting. I recognise this was quite a lengthy post, however the aim was to highlight some examples of how Moodle is being used at St Andrew’s College already and the impact it is having on eLearning. There is certainly more to do in terms of professional development for staff and increasing awareness of the variety of activities and resources available, and this will continue in 2014 as more students, particularly those in the Yr9 1:1 Programme, start to use Moodle on a daily basis. This entry was posted in eLearning and tagged eLearning, Learning management system, Moodle, Pedagogy, St Andrew's College by Sam McNeill. Bookmark the permalink. It’s fantastic seeing Moodle being used to its full extent as an e-learning tool! How would you recommend teachers learn to fully utilise Moodle as an e-learning resource?